This website (the “Website”) is provided as a service to clients, colleagues, and others for general information only. This information is not designed to provide legal or other advice or create a lawyer-client relationship. You should not take, or refrain from taking action based on its content. Please do not send us any confidential information until we have confirmed in writing that we represent or act for you. Unsolicited emails from non-clients do not establish a lawyer-client relationship, may not be privileged, and may be disclosed to others. Prior results and case studies do not guarantee a similar outcome in future representation. 1. Changes. Dentons may make changes to the Website and the Content and/or the services described on the Website at any time. 2. Proprietary Rights. The Website and the Content are the sole and exclusive property of Dentons and/or its licensors. You agree not to reproduce, duplicate, copy, sell, resell or exploit for any commercial purpose, any portion of the Website or the Content other than as expressly authorized by Dentons in writing. You hereby acknowledge and agree that, as between Dentons and you, all right, title, and interest in and to the Website and the Content shall be owned exclusively by Dentons. Use of the Website or the Content in any way not expressly permitted by this Agreement is prohibited. 3. Permitted Uses. So long as you agree and comply with the terms of this Agreement, and unless this Agreement is otherwise terminated by Dentons, Dentons invites you to view and/or print a single copy of the Website and the Content. You agree that you will not remove or modify any acknowledgements, credits or legal notices contained on the Website or in the Content. Special terms may apply to some services offered on the Website and may be posted in connection with the applicable service, feature or activity. Any such terms are in addition to this Agreement and, in the event of a conflict, any such terms shall prevail. 4. Additional Restrictions. You agree not to access the Website by any means other than through a standard web browser on a computer or mobile device. You further agree that you will not damage, disable, overburden, or impair the Website or interfere with any other party’s use and enjoyment of it. 5. About The Information On This Site. The Content available on the Website is intended to be a general information resource and is provided solely on an “AS IS” and “AS AVAILABLE” basis. You are encouraged to confirm the information contained herein. You should not construe Dentons’s publication of the Website as a warranty or guarantee of the quality or availability of any services. Any Content will reflect only English or United States legal principles (except where expressly stated otherwise). 6. Links To Other Sites. The Website may contain links to websites operated by other parties. Dentons provides these links to other websites as a convenience, and use of these sites is at your own risk. The linked sites are not under the control of Dentons, and Dentons is not responsible for the content available on the other sites. Such links do not imply Dentons’ endorsement of information or material on any other site and Dentons disclaims all liability with regard to your access to and use of such linked Websites. 7. Links. 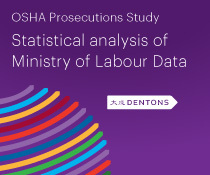 Unless otherwise set forth in a written agreement between you and Dentons, you must adhere to Dentons’ linking policy as follows: (i) the appearance, position and other aspects of the link may not be such as to damage or dilute the goodwill associated with Dentons’ name and trademarks; (ii) the appearance, position and other attributes of the link may not create the false appearance that your organization or entity is sponsored by, affiliated with, or associated with Dentons; (iii) when selected by a user, the link must display the Website on full-screen and not within a “frame” on the linking Website; and (iv) Dentons reserves the right to revoke its consent to the link at any time and in its sole discretion. 8. Trademarks. 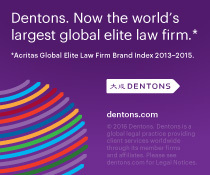 Unauthorized use of any Dentons trademark, service mark or logo are prohibited, and may be a violation of federal and state trademark laws. a. THE WEBSITE AND ALL CONTENT ON THE WEBSITE ARE PROVIDED TO YOU ON AN “AS IS” “AS AVAILABLE” BASIS WITHOUT WARRANTY OF ANY KIND EITHER EXPRESS OR IMPLIED, INCLUDING BUT NOT LIMITED TO THE IMPLIED WARRANTIES OF MERCHANTABILITY, FITNESS FOR A PARTICULAR PURPOSE, AND NON-INFRINGEMENT. DENTONS MAKES NO WARRANTY AS TO THE ACCURACY, COMPLETENESS OR RELIABILITY OF ANY CONTENT AVAILABLE THROUGH THE WEBSITE. YOU ARE RESPONSIBLE FOR VERIFYING ANY INFORMATION BEFORE RELYING ON IT. USE OF THE WEBSITE AND THE CONTENT AVAILABLE ON THE WEBSITE IS AT YOUR SOLE RISK. b. DENTONS MAKES NO REPRESENTATIONS OR WARRANTIES THAT USE OF THE WEBSITE WILL BE UNINTERRUPTED OR ERROR-FREE. YOU ARE RESPONSIBLE FOR TAKING ALL NECESSARY PRECAUTIONS TO ENSURE THAT ANY CONTENT YOU MAY OBTAIN FROM THE WEBSITE IS FREE OF VIRUSES OR OTHER HARMFUL CODE. c. TO THE MAXIMUM EXTENT PERMITTED BY LAW, DENTONS DISCLAIMS ALL LIABILITY, WHETHER BASED IN CONTRACT, TORT (INCLUDING NEGLIGENCE), STRICT LIABILITY OR OTHERWISE, AND FURTHER DISCLAIMS ALL LOSSES, INCLUDING WITHOUT LIMITATION INDIRECT, INCIDENTAL, CONSEQUENTIAL, OR SPECIAL DAMAGES ARISING OUT OF OR IN ANY WAY CONNECTED WITH ACCESS TO OR USE OF THE WEBSITE, THE CONTENT, OR THE GOODS OFFERED OR SOLD THROUGH THE WEBSITE, EVEN IF DENTONS HAS BEEN ADVISED OF THE POSSIBILITY OF SUCH DAMAGES. 10. Exclusions And Limitations. Some jurisdictions do not allow the exclusion of certain warranties or the limitation or exclusion of liability for incidental or consequential damages. Accordingly, some of the above limitations may not apply to you. 11. Indemnity. You agree to indemnify, defend and hold Dentons, its subsidiaries, and affiliates, and their respective officers, agents, partners and employees, harmless from any loss, liability, claim, or demand, including reasonable attorneys’ fees, due to or arising out of your use of the Website and/or breach of this Agreement. 12. Copyright. The Website is protected by international copyright laws. Except for your use as authorized above, you may not modify, reproduce or distribute the content, design or layout of the Website, or individual sections of the content, design or layout of the Website, without Dentons’ express prior written permission. f. A statement by you, made under penalty of perjury, that the information provided in your Notice is accurate and that you are the copyright or intellectual property owner or authorized to act on the copyright or intellectual property owner’s behalf. Company may, in its sole discretion, disable and/or terminate use of a Site or Sites by users who infringe the intellectual property of others. 15. Choice Of Law and Forum. This Agreement shall be governed by, and will be construed under, Canadian law; provided, however, if you are a resident of the United States, this Agreement shall be governed by, and will be construed under, the laws of the State of New York, United States of America, and you irrevocably agree to the exclusive jurisdiction by the federal and state courts located in the County of New York, in the State of New York, to settle any dispute which may arise out of, under, or in connection with this Agreement. YOU AGREE THAT NO CLAIM ARISING OUT OF THIS AGREEMENT OR YOUR USE OF THE WEBSITE MAY BE BROUGHT AS A CLASS ACTION. 16. Data Processing. Dentons takes the view that it is the “Data Controller” when it processes personal data related to and/or received from our clients and ultimately takes responsibility for managing that data in compliance with applicable data privacy regulations. Consequently the obligation to enter into a “personal data processing agreement” does not apply to Dentons and such agreements shall not be signed by us. a. If any provision of this Agreement is held to be illegal, invalid or unenforceable, such provision shall be struck and the remaining provisions shall remain in full force. b. Headings are for reference purposes only and in no way define, limit, construe or describe the scope or extent of such section. e. Any cause of action or claim you may have with respect to this Agreement or the Website must be commenced within six (6) months after the claim or cause of action arises or such claim or cause of action shall be barred. f. You may not assign or transfer your rights or obligations under this Agreement without the prior written consent of Dentons, and any assignment or transfer in violation of this provision shall be null and void. g. Dentons reserves the right to seek all remedies available at law and in equity for violations of this Agreement and/or the rules and regulations set forth on the Website, including without limitation the right to block access from a particular internet address.